Boil and mash two good sized Irish potatoes and while still hot add two Tablespoons of Butter, one Tablespoon of Lard, two Tablespoons of Sugar, one Teaspoon Salt, and one and a half Cupfuls of Water in which the Potatoes were boiled, and one Cupful of tepid Milk. Beat all well, adding gradually four Cups sifted Flour and when lukewarm stir in a Yeast Cake dissolved in one fourth Cup of tepid Water. Beat very hard, then turn out on a Board, adding more Flour as required and knead well. Set away in a warm sheltered Place for six Hours…. Roll, cut into Rounds, let stand until very light, and bake in a hot Oven. The recipe refers to yeast cake, which wasn’t invented until 1825, but perhaps the recipe is older and was modified. According to the wonderful website Food Timeline, potato breads have been around since the mid-18th century. Mashed or in the form of potato flour, potatoes were first added to bread when ingredients like wheat were scarce and expensive. Bakers then realized that potatoes actually improved the taste of bread, making it lighter (and whiter), so they started adding the tubers by choice. In the 19th century, potatoes became a common ingredient in breads and cakes, both in Europe and the United States, particularly where German, Irish, Scottish, and Polish immigrants settled. Potato rolls caught on not just in Virginia and the mid-Atlantic states but also in New England, where they were called “featherbeds” because of their lightness. Eleanor Early’s 1954 New England Cookbook includes a featherbed recipe, and although Early doesn’t discuss its origins, I noticed that it is virtually identical to the Virginia recipe above attributed to Martha Washington. Another “Martha Washington Potato Roll” recipe is in The Colonial Williamsburg Tavern Cookbook (2001). This one contains eggs and a whole stick of butter, so it’s quite different from the recipe above and seems more like a French roll. French rolls were very fashionable in well-to-do Virginia households in Martha’s time, so perhaps her cooks took this very genteel bread and added potatoes. Sacrebleu! But since many recipes in this book are merely inspired by colonial dishes, I don’t know how closely this one is based on what was actually served at Mount Vernon. 1. Place potatoes in a medium saucepan and cover them with cold water. Bring water to a boil, then reduce heat to medium and cook potatoes until tender, 20-30 minutes. Drain, reserving 1½ cups of the cooking liquid. While potatoes are cooking, bring milk to a simmer in a small pan, then remove from heat. 2. Mash the hot potatoes, then add the sugar, salt, and butter and blend well. Then add the reserved potato water and the milk and beat well. Cool mixture until lukewarm. 3. Add the yeast to ¼ cup warm water, stir, and set aside for five minutes until bubbly. Gradually add four cups of flour to the potato mixture and beat well. Then add the dissolved yeast and blend well. 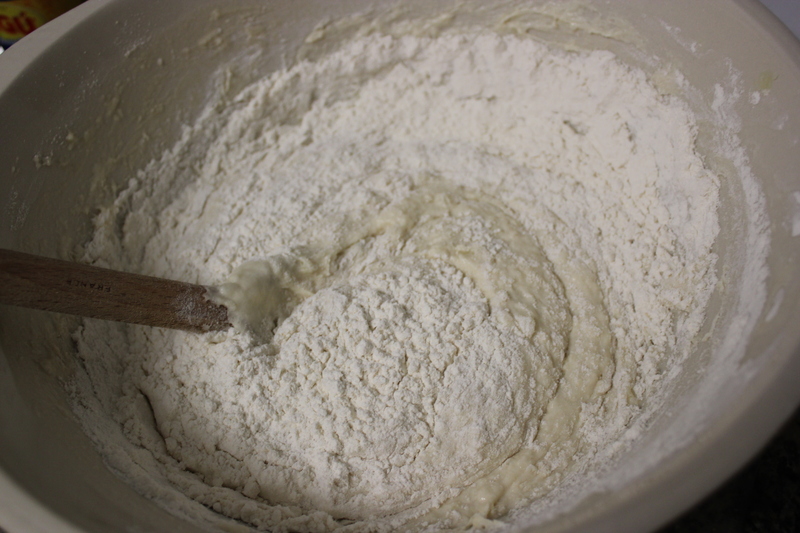 Add the remaining flour, about ½ cup at a time, beating well after each addition, until the dough is stiff enough to knead. You may not need to use all of the flour. 4. Turn dough out onto a floured board and knead until smooth and elastic (about 5 minutes), adding additional flour if necessary. Brush a large bowl with a thin layer of oil and place the dough in the bowl. Turn dough to coat with oil, cover with a tea towel, and let rise in a warm location for about 2 hours, or until doubled in size. 5. Preheat the oven to 400°F. Lightly grease two rimmed baking sheets. Turn the dough out onto a floured board, gently punch it down, then roll or pat to a ¾-inch thickness. Pinch off pieces of the dough and roll them into balls, then flatten these slightly. You should make about 24 rolls. To end up with the right number, I used a knife to cut the dough in half, then in quarters, then made six rolls out of each quarter section. (Alternatively, you could cut out rounds using a biscuit cutter.) 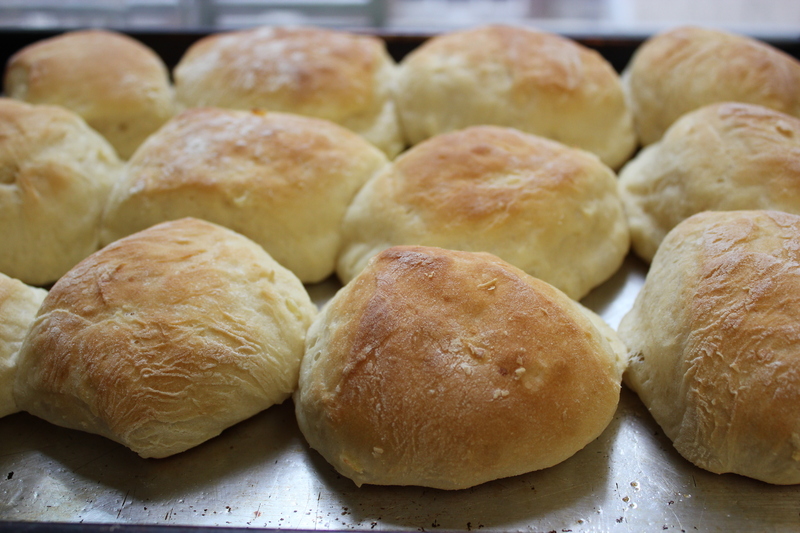 Place rolls slightly apart on the baking sheets, then let rise until doubled in size, approximately 45 minutes. Bake about 20 minutes, until golden brown on top. Serve warm. This entry was posted in breads and tagged 19th century food, baking, Dolley Madison, featherbeds, historic food ways, Martha Washington, potato, rolls, Williamsburg, yeast bread by revolutionarypie. Bookmark the permalink. So confusing when trying to track down the origin of recipes and when ingredients were first added, etc. And, you are right – historic recipes NEED to be used with caution. I have the recipe for potato rolls from my grandmother, printed in her old Pennsylvania Dutch cookbook – definitely German descent and definitely mid-Atlantic. We would also have these on light yummy rolls Thanksgiving. So, you are spot on! Yes, it’s a minefield out there. I immediately thought of the Pennsylvania Dutch connection since their fastnacht doughnuts are usually made with potato. How funny that you ate these on Thanksgiving! I think they’ve been largely supplanted by Parker House rolls. Your “possibly MW’s potato rolls” look divine! Enjoyed reading about your recipe searches and comparisons. I think I might have the Williamsburg Tavern Cookbook. Thanks for the lovely post! Thank you! Have you been to Williamsburg? If not, I really recommend it. I have seen several recipes for Martha Washington Cake in my old cookbooks too. Was her name used at that time as a way to identity certain foods as traditionally American? Hi Adam. The Martha Washington Great Cake was actually Martha’s recipe (though prepared by her servants), and it was written down by her granddaughter. But yes, her name seems to have ended up on a lot of recipes that are merely traditional. So many recipes have been adapted over the years without being identified as adaptations — and obviously that’s somewhat inevitable, but it’s also frustrating. Another problem with Martha Washington recipes specifically is that she inherited a cookbook — now called Martha Washington’s Booke of Cookery — which she probably rarely if ever used, but which is often mistakenly referred to as a collection of her own recipes. Thank you for this lovely documentation! 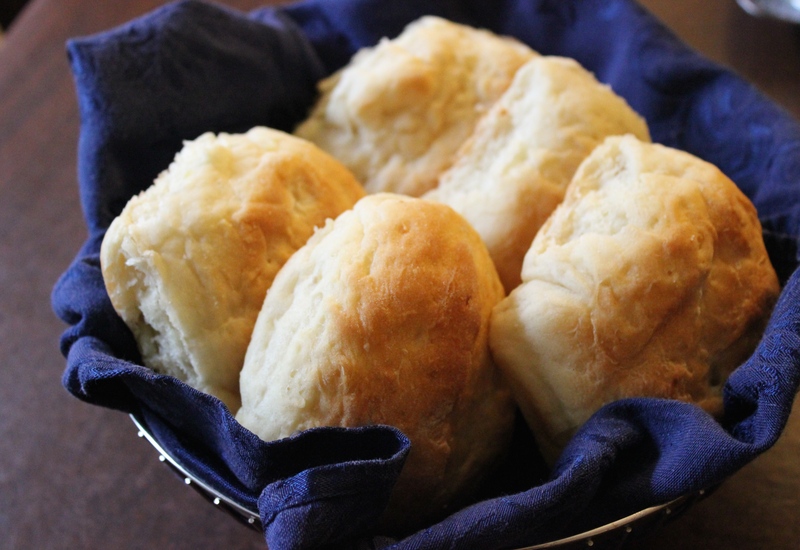 My grandmother’s recipe for these rolls comes from her maternal line – who emigrated from Virginia to Missouri in 1836…going back to the maiden name of Mary Fore (also spelled Faure) who was descended from French Heugenots who came to Virginia as part of the Manakin Colony. Our recipe calls for milk (not water) and Butter, and is raised overnight. My thought is that that it is a nice way to prepare the rolls for Sunday dinner – you roll them out and leave them to rise on Sunday morning while you go to church – they are ready to be baked when you return. We make them all through the year, but especially for holidays – some of the kids in our family would eat only the rolls for dinner! We all love them! Thanks for writing, Susan. It’s wonderful that you can trace your recipe that far back. What a nice family tradition!